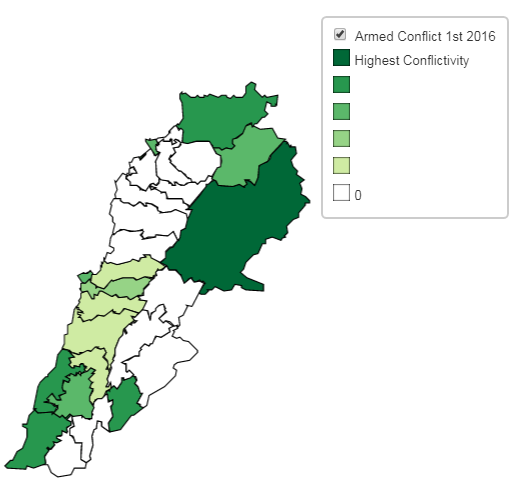 The Conflictivity Index is a tool developed by Lebanon Support, in partnership with the United Nations Development Programme, based on the “Geo-located Mapping of Conflicts in Lebanon,” and using its data. Through the use of heat maps, the Conflictivity Index aims to give a broad overview of conflict intensity in Lebanon, focusing on 4 dimensions: Armed Conflict, Security, State Response, and Collective Action. Each dimension is comprised of a number of categories from the “Geo-located Mapping of Conflicts in Lebanon” and highlights the intensity of conflictuality associated with mapped incidents in each caza. Explore the conflictivity dimensions here.